If you follow me on Twitter, you'll know that recently I've been reading Letting in Light by Emma Davies, a book I've enjoyed enormously. I'm delighted to welcome Emma to my blog to answer some questions and give us an insight into her writing. Before we get onto Letting in Light, tell us something about your early writing. Were you a child writer? If you came to writing in adulthood, what prompted you? And did you jump straight in and start with novels? I wouldn’t say I was a child writer, but I was definitely a child reader and that's where it all started. My earliest memories are of me with my head in a book, and the more I read, as I got older, the more I wanted to write. I started my first novel when I was about 16, a fantasy epic, which was very much my genre of choice at the time. I still have it tucked away in a drawer somewhere. 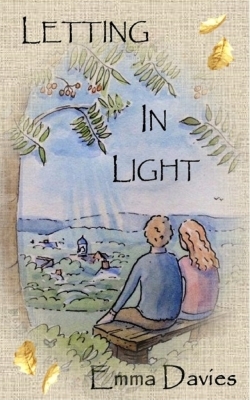 I wrote loads of short stories, and started several other books over the years, but Letting in Light is my first completed novel. Oh pantster definitely! I try to be a plotter but I’m not very good at I; I get far too impatient to start writing that I just pile in. I do plot as I go along, but only in terms of general notes or a need to make a certain reference at a certain point for example. Of course I have an overall plot, but I’m afraid I don’t plan out each chapter I just go with the flow and let my characters take it where it wants to go. Do you compose straight onto the computer screen or do you scribble it down first? When I first started writing Letting in Light I had no laptop or IPad and a very aged PC. My writing had to be mobile, so a pencil and notepad went with me everywhere. Typing up my work from notebooks once I’d finished the first draft was soul destroying and not an experience I wish to repeat. Now that I have better IT resources I compose straight to screen; still carry a pencil and notebook though, don’t think that will ever change! Are you a loner or are you a member of any writing groups or societies? I’m a loner, although I love the Twitter writing and reading community which I have found to be so supportive; I’ve learnt an awful lot just by reading others' posts and following their links or blogs. I have recently become a member of the Alliance of Independent Authors (ALLi) too which is a treasure trove of useful advice and information. I’m still trying to find the time to look through all of it. What was the start for Letting in Light? An idea? A character? A situation? Believe it or not the idea came to me when I went on a First Aid at Work course, which (as you will know, Susannah) actually forms a scene at the start of Letting in Light. I attended the course about 8 years ago and I was fascinated by the fact that over the course of four days, about nine people, none of whom knew each other before, were thrown together and for those days became quite intimate with one another, both physically and emotionally, and then after the course we all went our separate ways. It intrigued me that although we were very close for those days I never really knew anything about those people; the personas they presented could have been completely false, they could have had all manner of secrets hidden away, and I liked the idea of developing a scenario where an initial meeting of this kind could change people’s lives dramatically. Did you work with an editor or beta reader? No to both, I totally winged it! and never will be a novella kind of girl! You've chosen to write your book in the present tense. What made you do that? writing in present tense is a really good way of practising this. An aspect of Letting in Light which I loved was Ellie's move into her new home. Over the years I have had a lot of dreams about houses, all of them big and rambling and all of them belonging to me (I have a massive property portfolio, though sadly not in my waking life), and I love to read about characters finding their own special place to call home. What was important to you about Ellie's new home? I love houses too, particularly because I know that if you dream about exploring them it’s symbolic of your subconscious, and that has always fascinated me. Rowan Hill and its setting is so important for developing the characters in Letting in Light, and I think it says far more about them than a description of their appearance ever could. This was particularly important with Ellie, as the central character, and from whose point of view the novel is told, as the development of her house and the wider setting of Rowan Hill became a metaphor for her own development. I was out walking recently and came across a house that had a courtyard just like mine, complete with bell tower – it actually stopped me in my tracks! Well, this afternoon we watched Miracle on 34th Street which might give you a clue! Yes I’m a total nut for Christmas; it has to be at home though, with all our family traditions. The build up to Christmas is such a special time, I try to pace myself, but now that my girls are getting older (13 and 16) they’re as bad as me, so I’ve no hope at all. You have written a novel of emotional extremes. There is an act of great brutality (which occurs off-stage) and also a strong sense of developing love. Was it hard for you personally to tackle this? Did you feel confident about writing about the violence? I wanted to write a book that explored different types of love, for example maternal, brotherly, obsessive, passionate, and without giving too much of the plot away I hope I managed to do this to some degree. Although I didn’t find writing these scenes difficult, getting the balance right proved more of a challenge, particularly as you mention with the rather darker side of events. I deliberately set this aspect off stage as I didn’t want it to be too dominant, but neither did I want it to be trite and meaningless. It had to add depth and power to what comes after to show contrast and I did wrestle with the level of detail to put in. Ultimately I went with my instinct. Tell us about the publishing decisions and choices you made. Honestly, I’m a bit on the fence with this one. Buying a kindle was a real eye opener for me. Before then, like everybody else I bought traditionally published books, but as I began to read eBooks I realised that many of them were self-published, something I’d not really come across before. I used to work in bookselling and at the time ‘vanity’ publishing was very frowned upon. This was something different though, and not only that, the books I was reading were good, really good, and I found some new authors who are now firm favourites, whose work I would never have had the opportunity to read. This was the real impetus to finish Letting in Light and get it out there, quite simply because if it didn’t I would never know whether what I had written was any good, and I was prepared to take that chance; I needed this validation as reason (probably quite arrogantly) to carry on. I half-heartedly tried the traditional publishing route, but this is so competitive and takes so long that my impatience got the better of me. With hindsight I know I’ve done most of it back to front but I’m learning all the time. Am I a committed indie though? I’m not sure, which is where the fence comes in; show me a whiff of a publishing deal and I suspect I’ll be like a stick of rock with the word fickle running through it. I can't possibly have you here discussing Letting in Light without asking about cover illustrations. To start with, tell us about the original illustration, which appears further up the page. Where did it come from and how easy or difficult was it to choose? 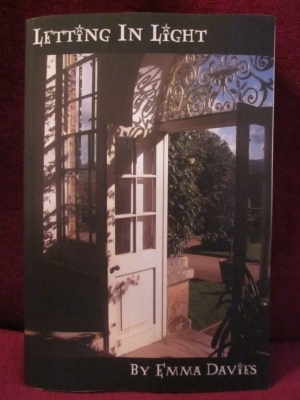 The original cover came from a photograph I took years ago at Powis Castle, a National Trust property, and (going back to my love of houses) it also provided quite a lot of inspiration for the setting of Letting in Light, particularly the gardens. When I came to publish, my complete lack of budget for a cover made the choice an obvious one. It seemed to echo the title well, but with hindsight it was a little too dark, and distinctly ungirly for a romantic read. Why the change to another illustration? Which came first - was it the wish for a new cover or did you see Katy Alston's work and say, "I've got to have that!"? The change to the new cover came with the desire to have Letting in Light seem more appealing to its target readership. Book covers are so important, and as time went on I didn’t feel that the original cover was doing the storyline justice. Katy is a good friend of mine and I love her work; she painted a picture of our old house for us a few years ago which still hangs on the wall so she was an obvious choice for me. I knew she could paint what I had in mind. It was a bit of a light bulb moment, and its worked well for both of us. I knew that Katy would like to have a go at book cover illustrations too, so what could be better than helping out a friend! How did you and Katy work together on the design? It was amazingly simple in the end. I just rang Katy up and explained what I had in mind and left the rest to her. She had read the book so sent me a couple of pencil sketches of her own vision and once I had decided the overall design she set to work on the watercolour. We tried one design and it worked well so Katy simply reproduced it in a little more detail, scanned it and emailed it. I played with it some more and Ta-dah! You blogged recently about the importance of setting priorities and making more time for your writing. Can you tell us how that is going? Slower than I’d like, but I am getting there. The main issue for me is the need financially to work full time, so changing this takes a bit of jiggling. My job is very demanding too, but thankfully I have a supportive boss who is happy to put some things into place to help. Once these are up and running, hopefully shortly after Christmas, the plan is to reduce my hours so I’ll get a whole day to write. I’m trying not to think about it too much though because I just get too excited! I’m busy writing my new novel which has a working title of The Amorous Intentions of Amos Fry and as so many people have requested one, I’m also playing with the sequel to Letting in Light. Besides which I really miss everyone at Rowan Hill, they’re like my best friends now and I’m not sure I will ever be able to let them go. worry it might not be as powerful or that you might not have as much material? them all into a pickle in the next book and seeing how they cope! Give us an idea of what you enjoy reading. Any advice for unpublished authors out there? You have to start somewhere, sometime, so it might as well be now. If you put it off until the time is right, you will never do it. Have faith. What has been your best moment as a writer and what would be your dearest wish? The best moment had to be when I first showed Letting in Light to a friend, the first person who had ever read it. She emailed me early one morning; it simply read ‘Am sitting here with tears pouring down my face. Oh. My. God.’ My dearest wish, well that’s easy, a bestseller list with my name on it! Emma, thank you so much for dropping by today. I wish you every success in the future. And you won't mind an unexpected visitor dropping in on Christmas afternoon, will you...? Thanks Susannah, the pleasure is all mine. I’m really grateful to have the opportunity to visit your blog, and of course you’re very welcome to come for Christmas. I’ll be just like Finn, six around the table, so cooking for twenty eight! Thanks for an interesting interview Susanna and Emma. I enjoyed getting to know Emma and finding out about the inspiration for her work. Houses (and the search for home) fascinate me too. All good wishes, Emma, for 'Letting in Light' (and reducing your working hours to have more writing time too). A very insightful interview, Susanna. I loved the questions that you posed and the honest answers from Emma. I wish her well with Letting In Light.